Base Length: 38.5" - 39.25"
Please measure your bathroom and bathtub carefully to make sure this product will fit your specific needs. Because this is a hygiene product, returns are not accepted except in the case of a warranty issue (one year for parts from the date of purchase; determined by the manufacturer). Extra-wide seat glides over polished, high-strength aluminum tubes. High weight capacity (500 lbs). 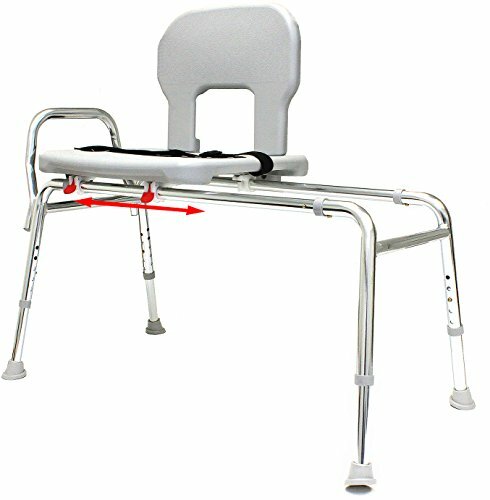 Specially-designed sliding rings help securely lock the seat at each end of the sliding rails. Molded plastic seat and back, textured finish. Rust-proof, lightweight aluminum construction. Easy to assemble; no tools necessary. Adjustable height to fit user and bathtub clearance.